Ok, so I made this thread to see if anyone else has had an experience like me. I was riding Jaguar at Knotts, and the lapbar just popped up, now knowing it was a pretty slow, not agressive family coaster, I didn't worry too much. But I was wondering if anyone else had an experience like me! - When an ops supervisor decided that the solution to declining hourly counts at Pirates was to put ops hosts in the water after dispatch to push the boats to go faster through the upper grotto. - On my first cast-only, pre-opening test ride on Body Wars, when my seat belt popped open as I was riding in a back-corner seat. I was told the ride was on a higher motion setting than it ultimately ended up using in normal operation, too. That might have been "unsafe," but is was the best damned simulator ride I've ever had! At Magic Springs in Hot Springs, Arkansas there was a very young kid running the Arkansas Twister coaster (the former Hurricane from Boardwalk and Baseball outside of Orlando). In the station he was sitting on a plastic patio chair very close to the track. Each time he would dispatch the train he would lean back and balance over the track. Pretty nerve wracking for all the guests in line but luckily he never fell in front of the oncoming train. When I used to work at Kings Dominion, guest would get into their heads that standing on the Rebel Yell was the best way to ride the ride. Now the Rebel Yell has seat belts now because of stupid guest. I saw a guy sunning himself at DLP on the lawn that also included the tracks to the railroad. I also saw somebody on DLP's Main Street Climbing a light pole to watch the parade. I've seen people climb air gates, I've seen my friend ride a stand up coaster the incorrect way (when he can't have kids he'll realize his mistake), I've seen teens put their arms under Grand Fiesta Tour and Living with the Land boats, I've seen teens stand up on Pirates, and I also almost saw someone fall into the track area on The Dark Night at Great Adventure. Edit: Also forgot to add the one time they didn't close my restraint on ET. I legitimately got scared. I almost fell into Jaw's mouth when the gate didn't properly at USO. My family still makes fun of it to this day! You were just trying to use the Floo Network too soon. Everything at Movieland in Italy. Everything. I did it during the featured Video was made..
^I've heard about that before. Saw a video, not sure if I'd do it. I've seen people get out of a Rapids Ride raft while it was in the rapids. SCAD Tower was the scariest thing I've ever done. Phoenix isn't a coaster, it's a near death experience lol (love it). I've been on a tiny Dragon Wagon I swear was going to tip over. Two summers ago I was at Mt. Olympus in Wisconsin Dells, stoked to ride Hades 360. We were next in line to board, but there was a delay when one of the lap bars wouldn't latch shut. It just kept popping up. One teenager running the ride looked at the other, shrugged, and declared "Clear" into the microphone. Off the train went. Also, what's the deal with Firehawk at King's Island? The entire harness comes down to a single point of failure - the seat belt-style buckle between the shoulder harnesses. I've never been genuinely terrified on a coaster until riding it. My hands were red and pulsating, because I was using the handle bars to push myself back into my seat and stay on the ride! I'm afraid I haven't ridden the others. While the restraints were bulky and felt secure, there weren't any redundant systems. If I accidentally unbuckled that seat belt, I'd be on the ground. Most unsafe thing I've seen is people using cell phones to record POV videos on extreme thrill rides such as El Toro and The Voyage. I've found myself sitting next to such people on these rides and was afraid they'd drop the phones, injuring someone. How anyone could hold the camera straight on these coasters is beyond me. ^I'm in the "hit by phone on El Toro" club. We were all strapped in to our Jeep about to start our Indiana Jones adventure at Disneyland. The cast members were signalling to each other that we were good to go and. . .this woman in the second row suddenly stands up and trades places with her young son. I don't know how she managed to unbuckle and stand up, but I've never seen Cast Members' faces go so white so quickly. One lurch of the jeep and some serious damage could have happened. 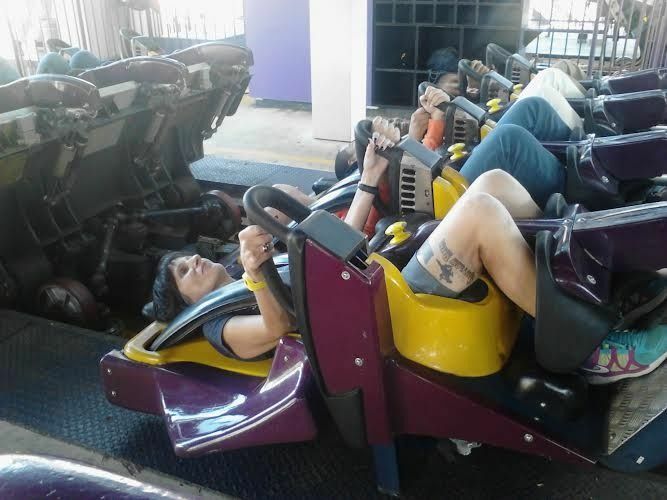 I spent the rest of the ride being irrationally furious with that woman. I bet she never even realized she'd done something dangerous. Clayton, you may not have noticed it, but the Vekoma Flying Dutchmans and B&M Flyers actually have some of the most secure restraints available. For example, the lapbar on Firehawk has two hydraulic cylinders below the seat that hold it in place, as well as a steel rod that extends into either side of the seat. Any one of these four mechanisms is strong enough to hold the restraint in place during the ride. I'm not 100% sure, but there may also be an electronic mechanism that locks the buckle on the harness while the train is in the lowered position, preventing accidental release. As for me, the most unsafe thing I can recall offhand was getting evacuated from the Blue Streak at Conneaut Lake Park. When I visited, it was part of a private event, so despite a thunderstorm they kept running the ride until the brakes were so wet they couldn't stop the train. Let's just say that instead of a simple walk down the stairs and back to the station, the evacuation felt more like an American Ninja Warrior training course. A runner up is children on Pirates of the Caribbean standing and leaning over the side to touch the water. The single parent was oblivious...they were reading their iPad during the entire ride.